Samsung will unveil its much anticipated folding phone and the Galaxy S10 on February 20th in San Francisco, it is expected. The firm today revealed the event, at the Bill Graham auditorium in San Francisco, which Apple has previously used for its launch events. ‘On February 20, Samsung Electronics will unveil new devices that promise to usher in new Galaxy experiences based on 10 years of innovations,’ the firm said. ‘We’ve set our sights on Galaxy’s future and are focusing on engineering the technologies and breakthroughs that will continue to transform the mobile landscape,’ the firm said in a blog post. 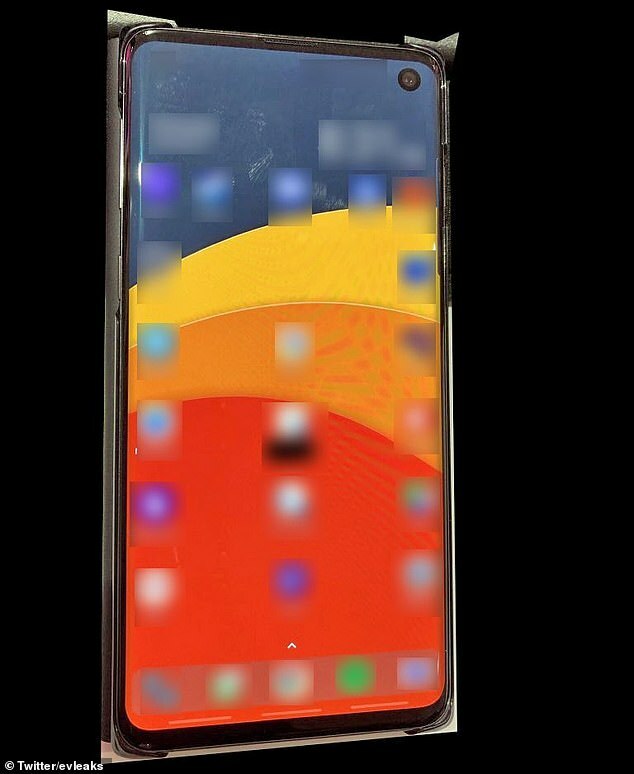 Recent images reportedly show the Galaxy S10 ‘in the wild,’ according to noted leaker Evan Blass. The photo shows the 5.8-inch ‘Beyond 1’ version of the upcoming phone, which features an all-screen design and a ‘hole-punch’ in the display. Samsung’s foldable smartphone was announced last week and leaked reports from Korea are claiming it will be more expensive that its rival, the iPhone XS. It is believed the pioneering handset will cost approximately two million Korean Won, which is around £1,370 ($1,760), before taxes. The pricey gadget has been labelled the Samsung ‘Galaxy F’ and is expected to be available to buy in early 2019.
iPhone’s current marquee device, the XS, starts at £999 ($999) while the larger XS Max is available for a minimum of £1,099 ($1,099). 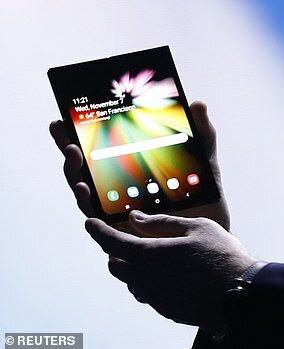 Kim Jang-yeol, head of research at Golden Bridge Investment, told the Korean Times that the device will be so expensive as a result of it being the first mainstream device to enter the unknown territory of foldable handsets. According to the leak, the screen will expand to a 7.3-inch OLED screen when unfurled and it will shrink to a 4.5-inch display when closed. The device is shrouded in mystery and Samsung has yet to release any confirmed details about the gadget’s specifications or release. Samsung’s Developer Conference last week provided the first glimpse at the device when a prototype was displayed on a deliberately dark stage. The tech giant has already confirmed that the phone has an Infinity Flex Display, which enables it to transform into a phone or a tablet when it’s opened and closed. While parts of the screen and its icons are blurred out, some details are distinguishable, like the nearly bezel-less screen, a slight chin on the bottom, as well as a camera cutout in the top-right corner. Bezels are a border around the edge of a phone screen and house chunkier technology such as home buttons, sensors, cameras and a speaker. Samsung first debuted this camera cutout design in the Galaxy A8S phone, released in China late last year, which features the ‘Infinity O’ display. ‘Infinity O’ is what Samsung calls the O-shaped cutout, used to house the front-facing camera. 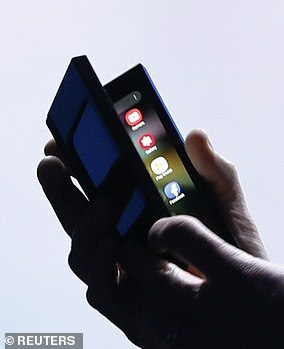 Samsung is also expected to launch a larger variant of the Beyond 1, likely to be named the Galaxy S10 Beyond 2. It’ll likely feature a 6.4-inch screen, two front cameras and two rear-facing cameras, as well as many of the same features of the Beyond 1. Verizon and Samsung said on they plan to release 5G smartphones in the first half of 2019 in the United States. Both are expected to be equipped with a Snapdragon 855 processor. 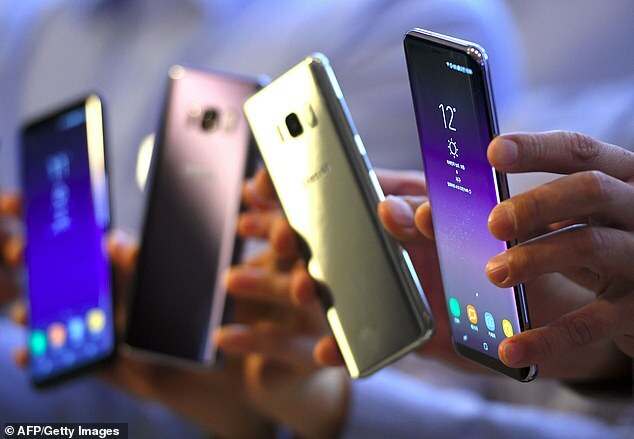 Consumers will have to wait a little longer to get their hands on the new devices, however, as Samsung isn’t expected to launch them until February, possibly at Mobile World Congress, an annual mobile technology convention. Previous leaks have also noted that Samsung might have more than two devices up its sleeve this year. Code from an Android 9 Pie update file, first discovered by XDA-Developers, showed that the firm may be preparing to release four versions of the Galaxy S10. WHAT DO WE KNOW ABOUT THE GALAXY S10? Samsung is widely expected to release the Galaxy S10 in February, which is when it usually launches S models. It’s unclear how many devices are planned for the lineup, but some have speculated it could include up to four phones. The firm is rumored to be releasing a low-end version of the S10, a base model with a 5.8-inch AMOLED display, a bigger version with a 6.44-inch screen, as well as a 5G model. Various leaks have indicated Samsung may move to ditch the notch entirely, instead opting for a nearly all-screen design that features an O-shaped camera cutout, also known as the ‘Infinity O’ display. The code describes what could be a low-end budget version of the S10, then a base model with a 5.8-inch AMOLED display and a bigger version that’s expected to have a 6.44-inch screen. Finally, the ‘beyond25g’ version may be Samsung’s first phone to handle 5G network connectivity. Previous reports have indicated Samsung plans to release a 5G-enabled smartphone next year. However, Samsung has said that the S10 won’t be its first 5G phone, which means the firm could be planning a separate handset with 5G connectivity.